Origin and Habitat: Northern Argentina (Catamarca, Jujuy, La Rioja, Mendoza, Salta, San Juan) . Altitude: It grows at elevations of 1700-3500 meters above sea level. 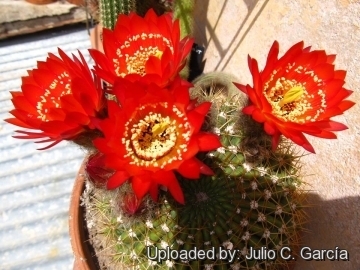 Habitat: The species has a patchy distribution but is locally abundant in high altitude in puna and prepuna grasslands, monte shrubland, and altos andes among large boulders on flats, slopes and ridges, together with other succulent plants like Lobivia schreiteri and Parodia tafiensis. 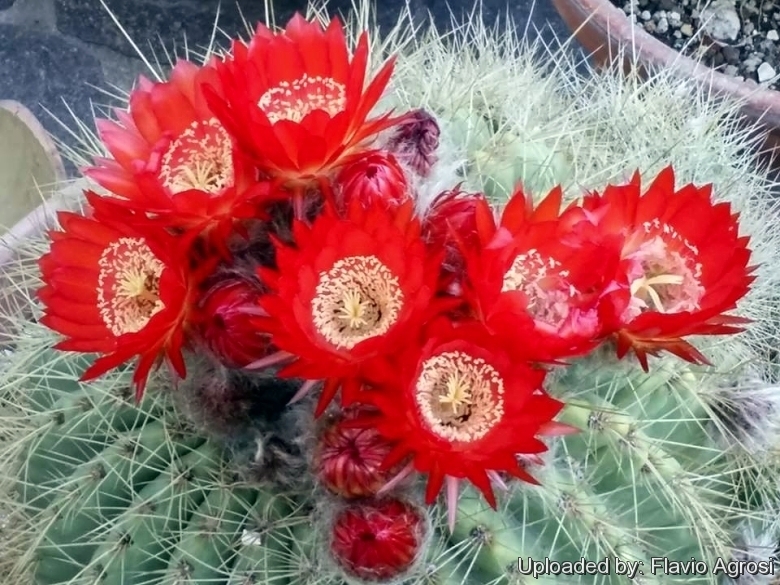 Description: Echinopsis bruchii (still known in cultivation as Lobivia bruchii or Soehrensia bruchii) is one of the larger Echinopsis species, the multi-ribbed bodies grow to as much as 50 cm thick. 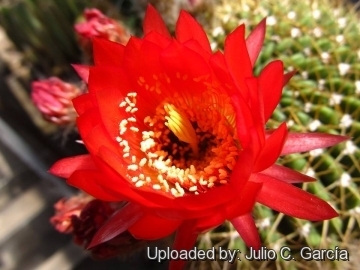 It has yellow or brownish-orange spines and brilliantly red blossoms. It is a morphologically variable taxon growing widespread in the mountains of Argentina and has received numerous unnecessary names. Similar species: The status of Echinopsis bruchii is controversial and some do not consider it an independent species, but a subspecies of Echinopsis formosa (Echinopsis formosa subs. Bruchii) which form a multiform complex, where each form is linked to others by populations of plants with intermediate characteristics. Habit: Plants usually solitary round or barrel-shaped, occasionally clustering. Stem: Globular, 20-30(-50) cm in diameter, becoming elongate or cylindrical with age 0,5-0,7(- 2) m tall, glossy dark green and more or less depressed in the centre. Ribs: 15-50 or more, distinct but low, more or less inflated or tuberculate between areoles. Areoles: Filled with short white wool. Spines: Several, spreading, usually yellowish or brown, those of the upper areoles connivent. Flowers: Diurnal, small, at areoles below the apex of plant, 4-5(-8) cm long and 4-5 cm in diameter, deep red to orange; tube of flower short, its axils filled with wool; inner perianth-segments lanceolate, slightly spreading; filaments exserted beyond the throat, but shorter than the perianth-segments. Blooming season: Spring to summer. Flowers last for 1 to 3 days (depending on weather condition). Echinopsis bruchii (Britton & Rose) Friedrich & Glaetzle: is one of the larger Echinopsis species, the multi-ribbed bodies grow to as much as 50 cm thick. 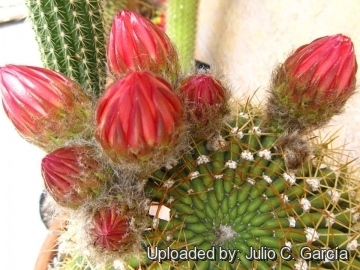 It has yellow or brownish-orange spines and brilliantly red blossoms. Distribution: Northern Argentina. Echinopsis bruchii f. albiflora (Y.Itô): White flowering form. Echinopsis bruchii f. brevispina (F.Ritter): has shorter spines. Distribution: Tafi del Valle, Tucumán, Argentina. Echinopsis bruchii var. nivalis (Frič) Rausch: has mostly yellowish or whitish pines and red blooms and grows in high altitude (3800-4100 asl). Distribution: Northern Argentina (Jujuy, Salta) . Growth rate: It is a relatively rapidly growing species that will make clumps given the best conditions. Exposition: The plant tolerates extremely bright situations which encourages flowering and heavy spine production, but is likely to suffer from sun scorch or stunted growth if over exposed to direct sunlight during the hottest part of the day in summer. It may tolerate filtered sunlight or afternoon shade.